The Accordion Encyclopedia - Part 2, from R to Tr: Reed, Reed Block, Reed Plate, Semitone, Sounding Board, Stradella Bass, Swing Tuning, Transit Damage, Treble Voices, Treble Coupler Labels, Tremolo Tuning. 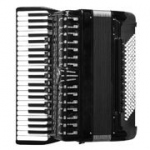 The Accordion Encyclopedia - Part 4, from Tu to Z: Tuning, Tuning Meter, Valves (Ventilli), Voice, Weighing, Weight, Well Tempered Scale, ‘Wet’ or ‘Dry’, Wood, Wrist Strap. When was the accordion invented? What do all accordions have in common?